Bosch vs Leica - Which is the Best Laser Measure? Bosch vs Leica: Which Is The Best Laser Measure To Buy? Which One Would You Prefer: Bosch or Leica? With the ever-increasing demands of the construction sites, there is the need to get the right tools that can help overcome such demands. The use of a laser measure has been on the rise for a while now. It is something that you could benefit from when it always seems hard to get the accurate measurements between various points. Well, now that you know about the laser measure, you might now be thinking which models would be the best laser measure to buy. Bosch versus Leica laser measure – Which is Better? Consider top-rated laser measures from 2 manufacturers: Bosch and Leica, below is a thorough comparison of two models from the two companies, which will give you the right features at an affordable rate. This article reviewed the non-Bluetooth Leica Disto D2 version. The “New” Disto D2 now comes with Bluetooth 4.0 and measures up to 330 feet. The range is always going to affect the number of applications that can be used with the laser measure. The Leica Disto D2 seems to offer the best range at 200 feet, which is important to make the model suitable for various applications. The Bosch GLM 50 C model does not disappoint much regarding range. With a range of 165 feet, it should still be able to remain competitive and deliver on your measuring needs. It is a tight race when it comes to accuracy of the two devices. Both laser distance measurers will give you a superior accuracy of ±1/16 inch. Such high accuracy puts the two models among the best models that will give you precise accuracy for various applications. Functionality is still a key in deciding between such two models. The Leica laser measure can offer functions such as calculating the distances, areas and volumes of a site. It can still offer additional Pythagorean functions to help with indirect measurements. The Bosch GLM 50 C Bluetooth laser does not disappoint either as it offers similar functions as the D2 model with some additional features. With the GLM 50 C model, you can also measure angles, min/max, double interact and stake outs, which the D2 model cannot do. Construction sites are no place for delicate products. Thanks to the manufacturers of these laser measures, they both boast of having remarkable durability. The Bosch laser measure has an impressive rugged design that sure keeps it useful for various tough jobsites, particularly when the site has a lot of dust and water hazard conditions. Leica Disto D2 is still a solid model that can deliver on better durability. The best part is that it has the IP54 certification showing that it can withstand cases of extreme dust and splashing. The display is important for better visibility, especially in various lighting conditions. 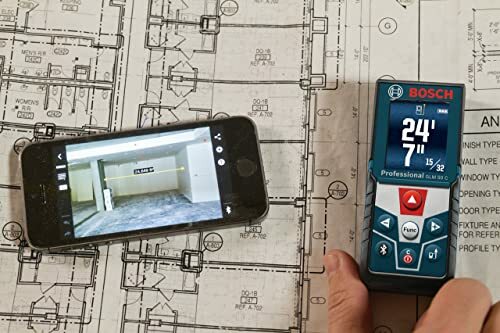 The Bosch Bluetooth laser measure offers a color backlit display. You get an easy time viewing the various measurements when using such type of a product. Leica Disto D2 uses the normal LCD display, which might not offer the same functionality as that of the GLM model. 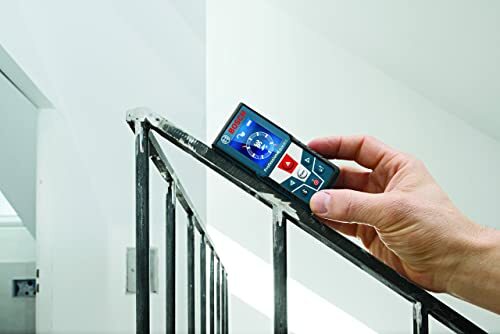 With the advancement in technology, the Bluetooth feature is an advanced feature to the Bosch GLM 50 C.
The Bluetooth connectivity helps you pair the device with other smart devices that can use the Bosch App. For the Leica Disto D2 model, it does not come with Bluetooth connectivity. The great news is the new models from Leica now come with Bluetooth technology. An upgrade should get you to enjoy such connectivity. The two models show nice features, but the Bosch GLM 50 C Bluetooth Laser Measure is my favorite. It comes featuring a number of additional features other than the basic features of just measuring distance, areas and volumes. With the color display with the backlit technology, the user should have an easy time reading the measurements even in poor light conditions. The GLM model is still compact, making it easy to use it on various sites. Still, the Leica Disto D2 is also a favorite tool for many users thanks to its high quality. The Bosch GLM 50 C Bluetooth laser measure is ready to handle simple distance measuring needs to even complex measurements. As a novice DIY-er or a professional builder, you now can use it for measuring the length, calculating area, volume and cases of indirect measurements. To help with better visibility, Bosch has equipped this laser measure with an impressive backlit color display. You should be able to use it even in the bright outdoors. The durability of a product is often a concern for any buyer. Well, with this model you get a sturdy build that should keep it working for longer. The manufacturer included a soft grip on the exterior to help protect the device from wear and other common damages. The Bluetooth technology is a nice addition to the overall functionality of the device. It would have been a good laser measure without Bluetooth connectivity, but now it is a better laser measure thanks to such technology. The Bluetooth connectivity makes it more convenient for saving measurements and making floor plan thanks to the free Bosch floor plan app. For a laser measure, it has to be practical, precise and easy to use. You get all that and many other features when you buy this model. The Leica Disto D2 is a compact measuring tool so that you will not feel any heavy when moving with it around the whole day taking measurements. With its innovative technologies, you should be in a position to take more measurements with a lot of ease. With the capability to handle areas and volumes, it can now translate your distances into important numbers in an instant. The operation of this Leica laser measure is quite easy, especially when you get to use the touchpad and clearly labeled keys. There are additional shortcut keys you get on the controls for easy manipulation of the device. Of course, the accuracy and range would be something that will determine if the Leica Disto D2 is worth buying or not. 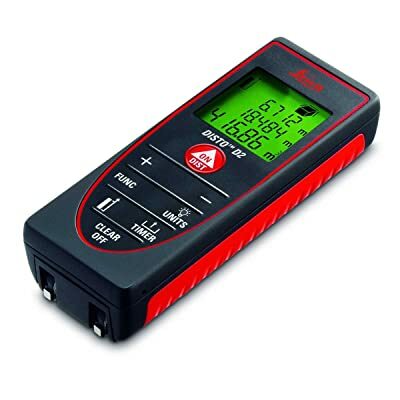 The accuracy of this laser distance meter is designed to be within 1/16 inch. That is so much better accuracy as compared to what you get when using a regular tape measure. On the other hand, the range is quite generous too for the money you pay. It delivers up to an impressive 200 feet. It should be enough to handle a range of applications. These Bosch and Leica laser distance measures have put on quite a show. Each model can boast of having different features that keep it ahead of the competition. You can always expect to have a hard time choosing between the two, as they are equally good. Whichever you decide to buy today, be sure that it can meet most of your expectations when it comes to measuring distances and calculating the areas and volumes of a site. If you were looking for something different, but within the same budget and functionality just like the two above, the Dewalt DW0350 laser measure would be ideal. To keep the model resistant to water and other types of debris, it can boast of having a better build. 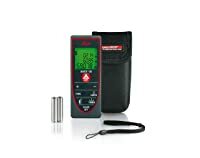 It still features many other features to become the best laser measure devices to buy today. The “New” D2 now measures out to 330ft and allows has the min/max function. I found that my New Leica Disto D2 has a stronger and more visible laser than the Bosch GLM50C. The fact is that the New Disto D2 has more extensive measuring range up to 330 feet compared with the previous version (200 feet).